The Bluegrass Chapter of the Society for Human Resource Management (SHRM) is comprised of approximately 300 HR professionals in the Lexington and Central Kentucky area. College students preparing for human resource management careers participate through Student Chapter affiliation. 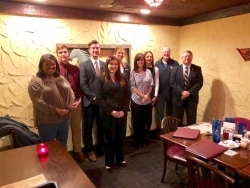 EKU’s Maroon SHRM recently became affiliated with Lexington’s Bluegrass SHRM chapter. Maroon SHRM was invited for a night of networking on Tuesday, November 27 at Columbia Steak House in Lexington. David Baumgartner, President of Bluegrass SHRM, and Amanda Huddleston, Student Relations Director for Bluegrass SHRM, were in attendance. Also in attendance were industry professionals from the Fayette Urban County Government, staffing firms, and Dr. Allen Engle, Maroon SHRM’s faculty advisor. “It was a great evening to network and get to know each other,” said the student group’s Chief Operating Officer, Cari Williams. Brad Jacques (Chief Learning Officer) and Samson Reed (Chief Information Officer) were also present.